Can I use K Command to counter a Spell? 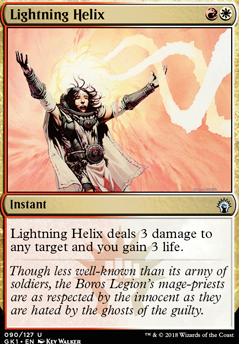 Lightning Helix deals 3 damage to target creature, player or planeswalker and you gain 3 life. Thanks for the suggestions and compliments TypicalTimmy. 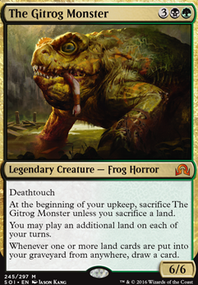 I was actually looking at ways to get more lifegain into this deck since I think it may struggle when be focused down by multiple opponents. Venser's Journal seems perfect since it also gives no max handsize. I had originally disregarded Lightning Helix since it can't double target like Expose Evil or Soul's Fire , but the fact that I could just continuously target Feather and gain 3 life a turn is something worth considering. Unfortunately Approach of the Second Sun won't trigger Feather since it doesn't target any of my creatures. That being said, the amount of cantrips included here allows me to churn through the deck pretty quickly so it isn't a bad idea as a secondary win-con. So the first thing I noticed is that you pick a lot of cantrips that allow you to draw cards. Smart move. I would recommend looking into Venser's Journal . You'd need to drop a card for this one, but I think it is well worth it. You can essentially begin drawing massive amounts of cards with your cantrips as they stack up, and gain a lot of life for doing so. I feel it's perfect for your deck. Speaking of life, Lightning Helix will see massive utility in this deck. There is also Warleader's Helix , but I don't find that the extra 1 point of damage and 1 life is worth the additional mana. Finally, I would highly advise you look into Approach of the Second Sun . Normally when you cast this, a replacement effect happens and the card is moved to 7th from the top rather than your graveyard. However, Feather's ability is also a replacement effect. 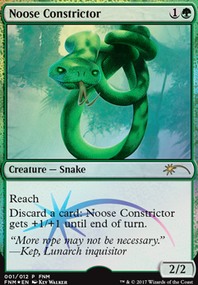 With two replacement effects looking to resolve on the same card, it's just a matter of ordering / choosing what you want done first. 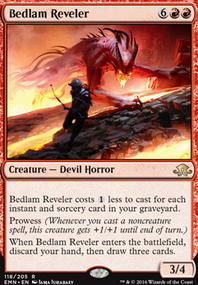 So, exile Approach and put it into your hand to cast it on the following turn to win the game. Yeah, I wanted to make a modern-playable card, and also, I mean, 4, color-specific mana is a whole lot. 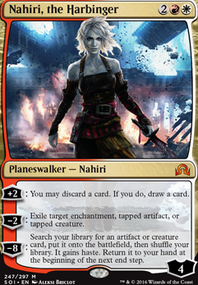 Vindicate , Lightning Helix , Boros Charm , Kolaghan's Command , were the main bases for the card. Also, Orcs have attack-triggered abilities, and a narrower annihilator effect seemed good. Maybe menace would have been less powerful, but it seemed less interesting. Went 1-4 at Modern Unified. Played with less fetches and no Rest in Peace to harmonize with my teammates lists. Losses to Ad Naus, Phoenix, Burn, and Affinity. Win vs Phoenix. My biggest takeaway was that Skullcrack over-performed vs Lightning Helix . 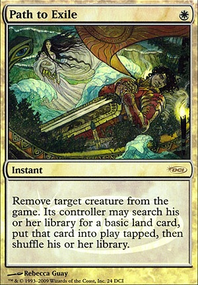 Used it to stop big life gain moments and turn off protection from Red creatures. But overall, with the exception of Ad Naus, I won all the games I was on the play and lost all the games I was on the draw. Weird.